Geothermal and solar energy are used to provide heating in two five-storey apartment buildings completed in spring 2011 on Lanssikatu, near Lahti city centre. There is still relatively little experience of constructing low-energy buildings of this type and, for the moment, there are few new construction apartment buildings using geothermal heating in Finland. In the planning stages, high goals were set: up to 30% lower energy consumption than in a comparable building that does not use Finnish low-energy solutions. With the right solutions, the energy goals were met. 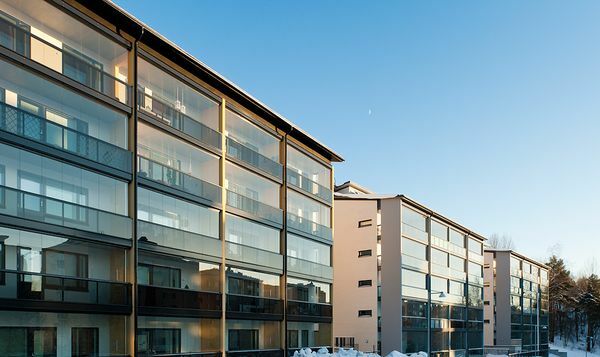 Approximately 95% of the required heating and cooling energy for the buildings is generated by ground source heat pumps supplied by the Lahti-based company Oilon, with the remaining 5% coming from solar collectors. Approximately 50–60% of the energy needed for domestic hot water is produced by solar collectors and the rest by geothermal heating. Energy savings are increased by efficient ventilation heat recovery as well as regenerative lifts that make use of braking energy by feeding it back to the building’s electric grid. In addition to Oilon, the building project, led by municipal housing company Lahden Talot, involved numerous partners from different fields.